Stove top potpourri is my favorite thing to do to instantly get our home smelling like fall or Christmas. Here in Phoenix we pretty much skip fall. It goes from 117 -60 degrees in like 6 seconds and we only get a glimpse of what fall looks like and feels like. So to join the rest of the world and all those who are actually getting a fall, I make this oh so deliciously scented Stovetop Potpourri and we are instantly transported into a different season. Making stove potpourri is actually really easy! It dosen’t take much. 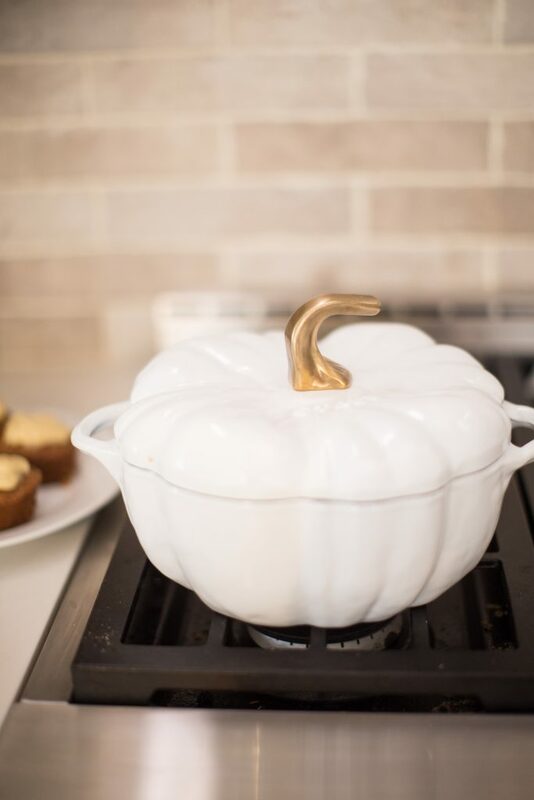 Just throw all the ingredients into a pot, (I happen to bust out my Staub cast-iron pumpkin, cause why not right?) and simmer on low until your water line is low! This is great for when you’re entertaining a big crowd or for when you just don’t want to burn a candle. I’ll usually make a batch right after I clean the kitchen just to finish off all my hard work. 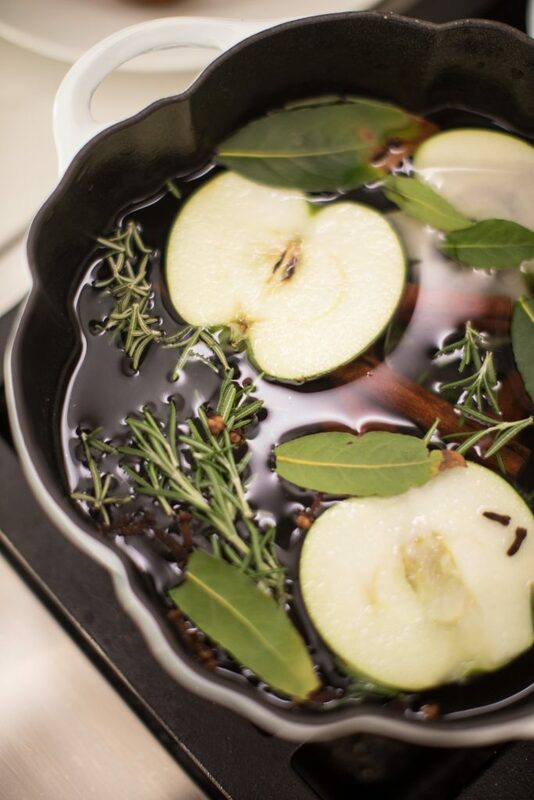 My favorite combination is sliced apples, cinnamon sticks, cloves, pinch of nutmeg, fresh rosemary and bay leaves straight from my backyard. Other great add-ins are cranberries, oranges, lemons, or any all spice! Warning, the smell just might inspire you to make some apple pie! Bring all ingredients to a slow simmer in a big pot. Keep simmering until water line is low. Add more water if needed! 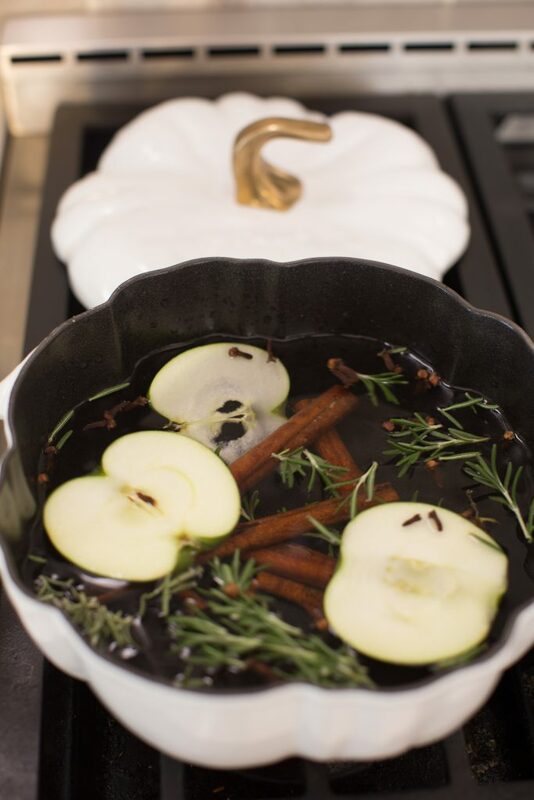 Are you ready to try this simmering potpourri to get your fall on? I sure hope so! You won’t regret it! You can simmer this for Christmas as well in some of my favorite dutch ovens.